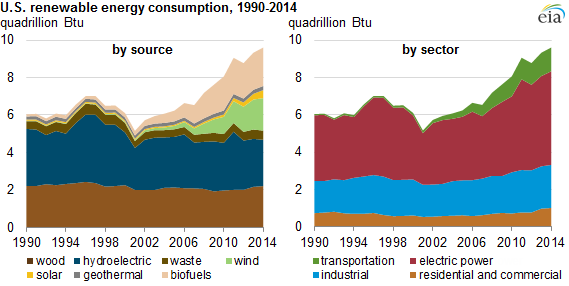 Renewable energy accounted for 9.8% of total domestic energy consumption in 2014. This marks the highest renewable energy share since the 1930s, when wood was a much larger contributor to domestic energy supply. Source: U.S. Energy Information Administration, Monthly Energy Review Note: Sector shares represent the renewable share of primary energy consumed in the sector. Renewable energy use grew an average of 5% per year over 2001-2014 from its most recent low in 2001. The increase over the past 14 years was in part because of growing use of wind, solar, and biofuels. Wind energy grew from 70 trillion Btu in 2001 to more than 1,700 trillion Btu in 2014. During the same period, solar energy (solar thermal and photovoltaic) grew from 64 trillion Btu to 427 trillion Btu, and the use of biomass for the production of biofuels grew from 253 trillion Btu to 2,068 trillion Btu. Hydroelectricity was the largest source of renewable energy in 2014, but hydro consumption has decreased from higher levels in the mid-to-late 1990s. Wood remained the second-largest renewable energy source, with recent growth driven in part by demand for wood pellets. In 2014, slightly more than half of all renewable energy was used to generate electricity. Within the electric power sector, renewable energy accounted for 13% of energy consumed, higher than its consumption share in any other sector. The industrial sector used 24% of the nation’s renewable energy in 2014. Nearly all of that renewable energy was biomass, which included wood, waste, and biofuels used in manufacturing processes as well as in the production of heat and power. The production of biofuels results in energy losses and co-products, which are also included in industrial consumption of renewables. About 13% of the renewable energy used in the United States is now consumed in the transportation sector, which experienced the largest percentage growth in renewable consumption from 2001 to 2014. The growing demand for liquid biofuels, including both ethanol and biodiesel, pushed renewables to nearly 5% of the sector’s energy consumption in 2014. A greater use of wood for home heating and steadily growing installation of solar systems are the main contributors to increasing renewable energy consumption in residential buildings and, to a lesser extent, in commercial buildings. The “Today in Energy” brief was originally posted on EIA’s website. Principal contributor to the report is Mary Joyce. One person (~100 kg) mostly alone are moving from place to place in car (~2,000 kg). Efficiency of engine is around 30%, efficiency of gasoline production is ~45%. As we can see, real efficiency of this movement is less than 1%. Mankind fooled by deadly wrong theory that greenhouse gases are responsible for climate change are moving in wrong directions how to reduce amount of greenhouse gases (absolutely useless for climate). Please, read more: Amazon.com/book in line book print Dogmas for Billions. WE MUST REEVALUATE DEADLY WRONG SCIENCE OF CLIMATE CHANGE AS SOON AS POSSIBLE. Building with Adobe as a Cost Effective Solution for Home Construction?